Why is Lumbini important? For 500 million Buddhists throughout the world, this sacred garden is where it all began. 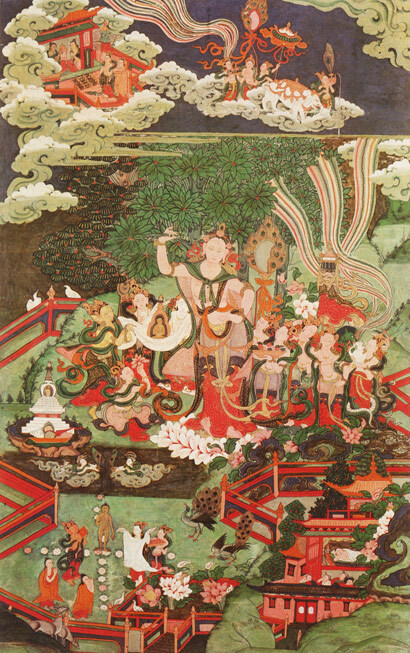 More than 2500 years ago, as Queen Maya Devi journeyed from Kapilavastu to visit her mother in Devadaha, she paused for rest in the enchanting garden of Lumbini. Emerging refreshed from her bath in a shimmering pond, she grasped the bough of an asoka tree for support. At that instant, by the light of the full moon in May, Queen Maya Devi felt the earth move beneath her feet. From her right side, she painlessly gave birth to Siddhartha Gautama—the prince who would become the 4th Buddha among the 1002 Buddhas of our Fortunate Age. Thus, when the resplendent Lion of the Sakyas, the Greatest of Sages, the Illuminator of this World took birth among living beings that spring night, the whole world was pervaded by an immense light that enveloped all beings in blissful tranquility. To this day, the sacred Garden of Lumbini, birthplace of Buddha Sakyamuni, serves as the gateway of His indisputable teachings, ceaselessly radiating the light of His inexpressible wisdom and powerful blessings. But where on Earth is this most holy of all birthplaces? Historians firmly agree that Lord Buddha’s birthplace lies in modern-day Nepal where the southern plains of the Terai meet the mighty Himalayas. 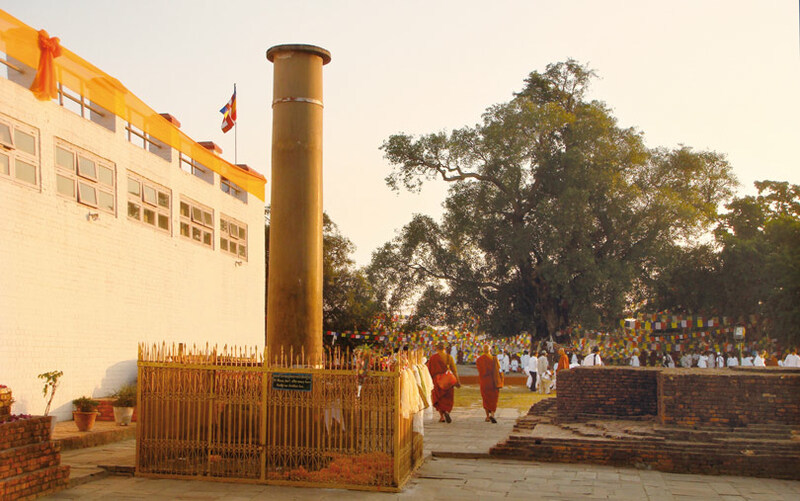 Based on the detailed chronicles of two early Chinese Buddhist pilgrims, in 1896 archeologists were able to pinpoint the exact location of Lumbini and discover the majestic sandstone Edict Pillar erected in 249 BC by the devout Indian King Asoka. Furthermore, through the millennium many thousands of carefully preserved Buddhist canonical scriptures authenticate the locations of sites sacred to the Buddha’s life and teachings. The Gardens of Lumbini have long been recognized as a place of outstanding beauty and immense importance. An atmosphere of tranquility ceaselessly pervades the Buddha’s blessed nativity site. In 1978, the renowned Japanese architect Kenzo Tange created an overall Master Plan for developing the area and in 1997 UNESCO designated Lumbini a protected World Heritage Site. Buddhas of our Fortunate Age must take their final birth there. The United Nations continues to generously support archaeological excavations in Lumbini so that now foundations of numerous stupas, monasteries and the ancient temple of Queen Maya Devi have been unearthed. Even now, we can still behold the Puskarni Pool where the Queen bathed before her delivery. 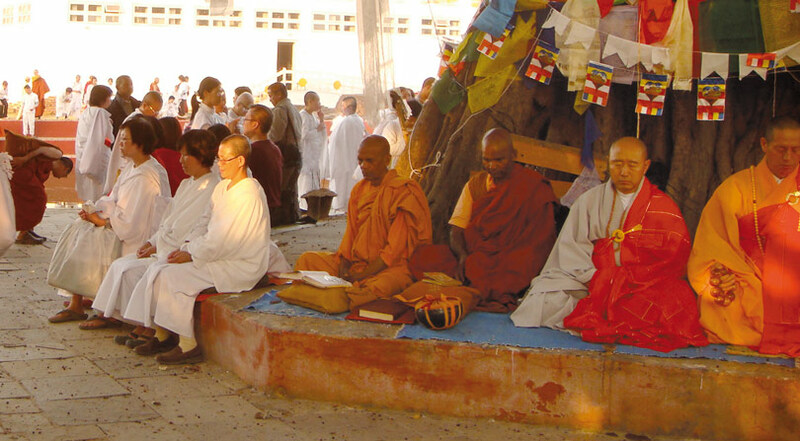 A shady bodhi tree marks the spot where the Bodhisattva’s feet first touched the earth. To the southeast, Tillar Nadi—the River of Oil—still flows uninterruptedly. Thus, Lumbini is a marvelous treasury of momentous archeological ruins bordered by a spacious Monastic Zone of magnificent monasteries representing the fervent devotion of Buddhists from throughout the world. Lumbini is one of the four major Buddhist holy places commemorating the most significant events in the Buddha’s life. Since pilgrimage is an affirmation of faith utterly essential to Buddhism, without Lumbini no other Buddhist pilgrimage sites would exist. Pilgrimage, prayers, meditation and practice in these four major sites is a profound way to connect with the Buddha and his message. Why? Because the sublime power and uninterrupted blessings of such pilgrimage sites immensely accelerates the ripening of our fervent good wishes. “These, Ananda, are the four places that a devout person should visit and look upon with feelings of reverence. And truly there will come to these places, Ananda, devoted monks and nuns, laymen and laywomen, reflecting: “Here the Tathagata was born! Here the Tathagata became fully enlightened in unsurpassed, supreme enlightenment! Here the Tathagata turned the unexcelled Wheel of Dharma! Here the Tathagata passed away into the state of nirvana in which no element of clinging remains!